Montreal has this thing they call the Tam Tams. It’s a free drumming circle, anyone can join, either as a drummer, or a dancer, or one of hundreds of fans just there to enjoy the music and the sun, and the people on display. It’s a weekly event in the summer, every Sunday starting around noon, going till sundown. Just look for the George-Étienne Cartier Monument in Mount Royal Park (the big-angel-on-a-stick statue). You can’t miss the sound of the drums. Seems like any instrument is cool, just join the cacophony. People bring all kinds of drums and percussion instruments. Everything from 4 foot tall carved wooden monsters to slick little hand drums made of fiberglass and mylar. Some guys have high tech body harnesses, some just sling their drum off a hemp rope. I also saw brass trombones, pan pipes, and a few things I didn’t recognize. There’s vendors nearby, you can buy finger cymbals or a tambourine if you want to join in. There are even belly dancing veils and jingling belts available, if that’s more your mode of expression. 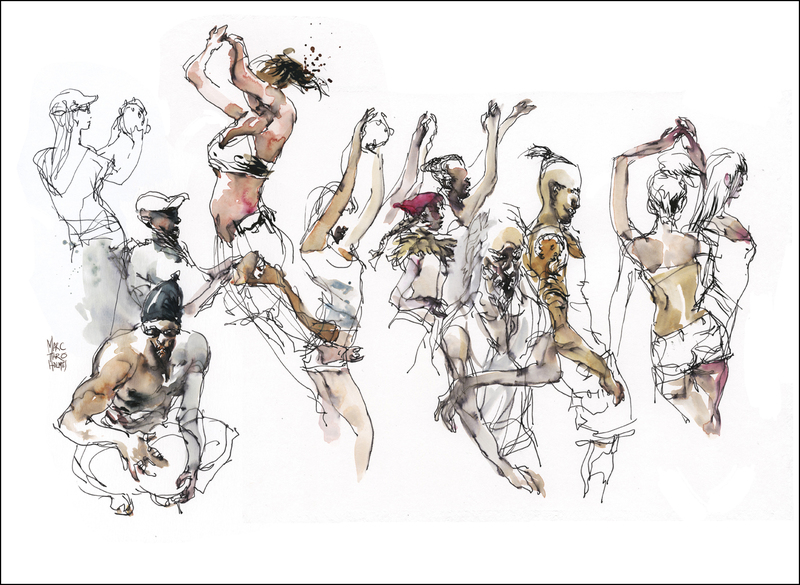 The main attraction for a sketcher like myself is the mosh pit of dancers. Everything takes place in a little corner, off to the side of the statue, backed on two sides by a 4 foot wall. This makes a little amphitheater that fills up with a mass of gyrating, bumping, and grinding bodies. 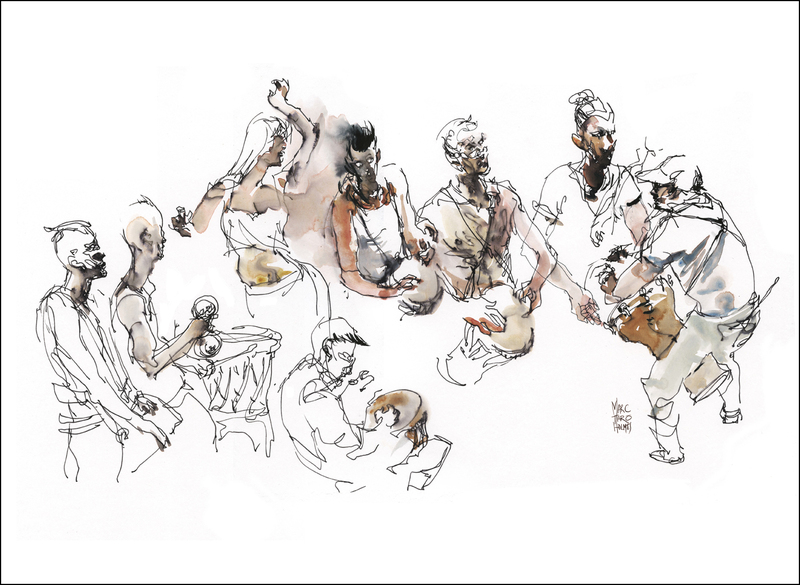 The drumming never stops – one person gets tired, another steps in. It’s hypnotizing. 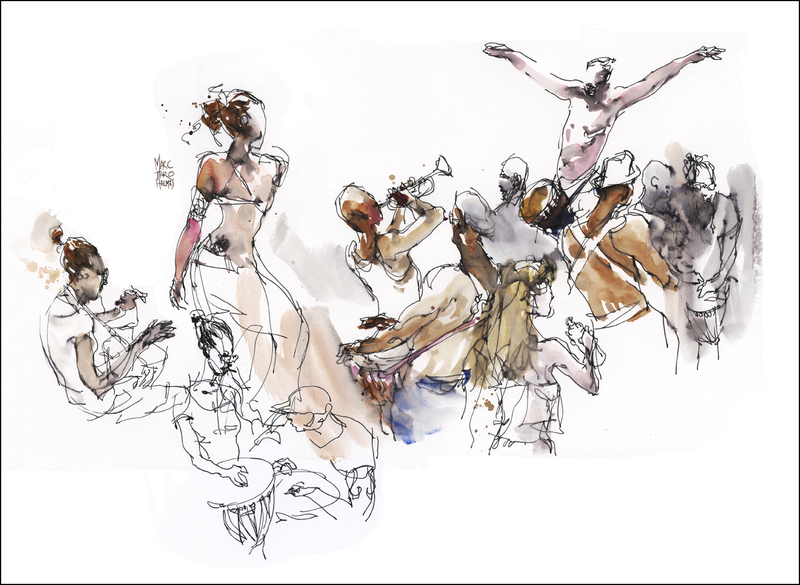 You could dance – or draw – for hours without coming up for air. I hear this thing is a meetup for dope fiends, but to be honest, I didn’t see any of that while I was there. I suppose they have secret codes to find each other in the crowd. I think that’s a thing if you want it to be, but most people are there for the sun, the music and the weird opportunity to merge into the tribe of drummers and dancers. If you ever thought a place had ‘good vibes’ – this would be it. Thank you. This was fascinating! Enjoy your sketching very much and the opportunity to be there through your experience for awhile. I absolutely love your work and can’t wait to check out each post. I have never heard of Tam Tams – sounds fabulous. I love your sketches, they really show the spirit of the day. Marc, these works really capture the movement and feeling of Mt-Royal! I’m excited when I get emails when you update the blog. Refeshing! I can feel the energy of that scene with those fluid lines. Nice work! You have a lovely loose approach to sketching which really lends itself to the subject matter.